New England Patriots tight end Rob Gronkowski is a busy man these days - taking part in organized team activities, shaving his head to support kids with cancer, even attending friends’ weddings. On Saturday, a video surfaced showing the tight end intercepting a wedding bouquet and GronkSpiking it to the ground. If this is any indication of how Gronk is currently feeling and recovering from his back surgery, I’d say things are looking good. On Sunday afternoon at Gillette Stadium, Gronkowski took part in the One Mission Buzz Off fundraiser. It was Gronk’s sixth appearance and the organization’s eighth event overall. So far, the Buzz Off event has raised over $7 million for kids with cancer. Gronkowski’s brothers, Gordie and Glenn, also shaved their heads at the event, as did members of Gillette Stadium’s End Zone Militia. At the event, Gronk took time to speak with reporters about how Patriots OTAs are going and talked a bit about his overall health. So far, Gronk has practiced without restrictions, as per ESPN’s Mike Reiss. 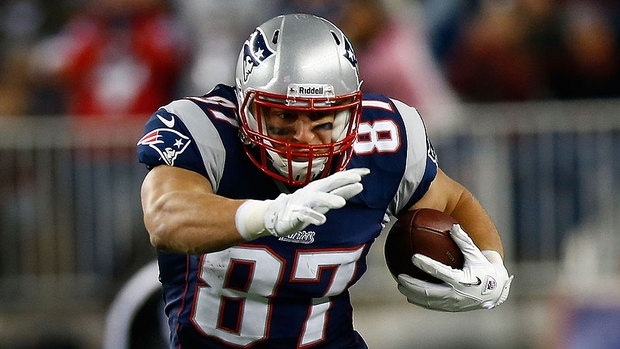 This comes as great news to New England fans, as the star tight end was limited to just eight games last season.